DOES MILEY CYRUS’ ‘YOUNGER NOW’ GET DAVID’S TICK OF APPROVAL? In his latest review, David gets his teeth stuck into the new Miley Cyrus album ‘Younger Now’. Will it leave him impressed? Or will it leave him with a bad taste in his mouth? Say the name ‘Miley Cyrus’ and most people have an automatic opinion about her. She’s been a part of our lives since ‘Hannah Montana’ and during that time we’ve seen her go from wholesome to wild child and back again. One thing that’s pretty much remained a constant for her though is her undeniable talent. You can’t help but appreciate the power of her voice and her desire to be herself. Asides from her odd mixtape release (Miley Cyrus and Her Dead Petz) Miley’s music has been incredible to listen to too. 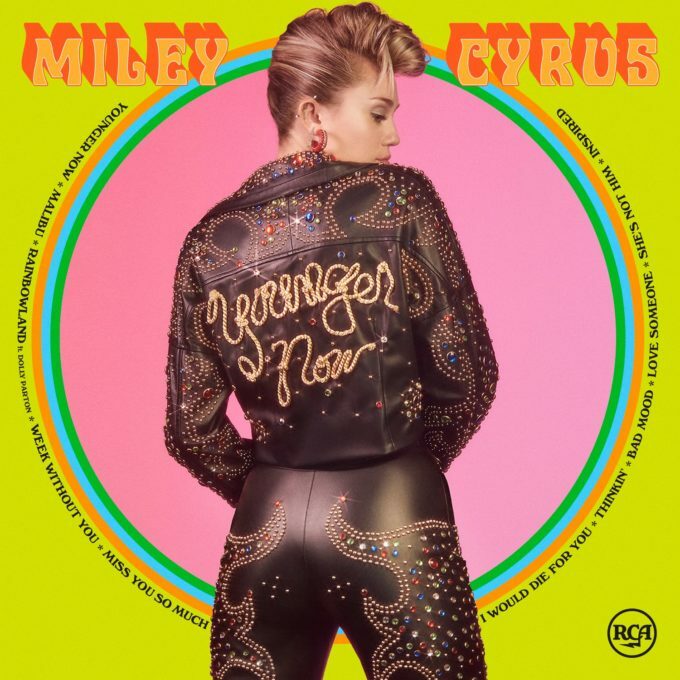 With this being her sixth studio album, ‘Younger Now’ sees Miley return to her pure music roots and it’s an enjoyable return. Lead single ‘Malibu’ is one of the catchiest songs of the year with its laid back vibe and earworm worthy chorus. You can’t help but find yourself humming along at the most inopportune moments. It also received a great Tiesto remix which is a sign it has grown legs of its own. ‘Malibu’ showcases a bit of a shift from her previous pop bangers (or ‘Bangerz’ if you want to get technical…) into more inspired pop music. It’s probably more of who she truly is than any of her previous material and harks back to her ‘Time of Our Lives’ EP. Most of the songs here take on a bluegrass or country undertone. This is extremely prevalent on ‘Rainbowland’ with the appearance of her godmother Dolly Parton. It’s a pretty cute song about inclusion and feels like a good sing along song at a concert. It is perhaps a bit too skewed towards country music, but it shows off Miley’s desire to make a difference through her music. Most of the tracks here take a mid-tempo approach and one of my favourites is title track ‘Younger Now’. There’s something incredibly relatable to the messaging here and Miley sounds confident, strong and powerful; almost as if she’s in control of her destiny. When I first heard this song, it gave me chills. “No one stays the same / You know what goes up must come down” she laments and this reflective song about change is so true of Miley. She’s had her ups and downs but remains a supremely talented performer and entertainer. One could also say she’s a bit of a chameleon with the way she shifts between genres and personas. Up against some strong rivals in release week, this album has the potential to get lost amongst the crowd which is a shame. What I think Miley has done extremely well is to deliver an end to end album that is a consistent one and a great listen. She hasn’t created something that’s going to set singles charts alight, but it’s not about that. It’s about growth, change and being herself. And on ‘Younger Now’, she’s achieved that. MUST LISTEN : Younger Now, Miss You So Much, Inspired.